Tucked away on a private lane, this luxury Santa Fe vacation rental is only blocks away from Canyon Road and one mile from the Plaza. 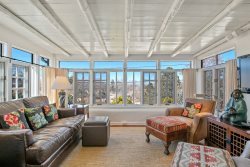 Situated in a tranquil setting, this home is nothing short of stunning and perfect for the most discriminating traveler. The furnishings are impeccable and the layout of the house is perfect with en-suite bathrooms for each of the three bedrooms. 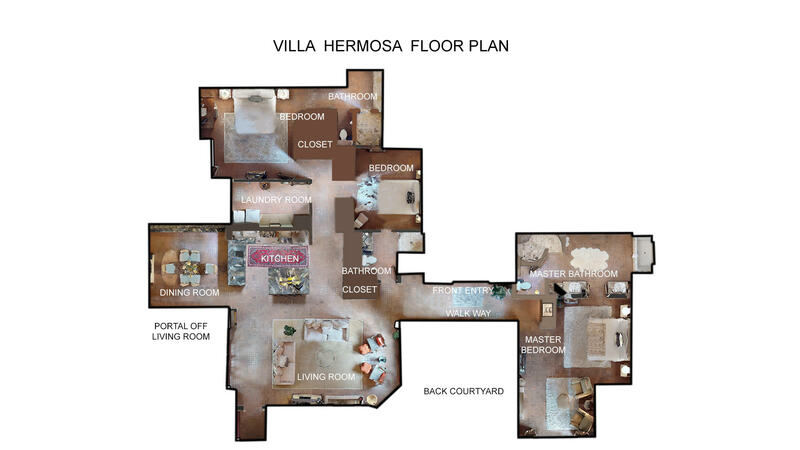 Villa Hermosa has an open layout for the living room, kitchen and dining area. The house is filled with natural light, handcrafted cabinets, high-end finishes throughout, vigas, brick floors,n and is a double adobe home with ample parking, and incredible gardens which sit on a half of an acre Hand troweled plaster walls add the elegance of the home. You will have a private walled yard and gardens. There are four fireplaces: in the living room and master bedroom, as well as two outdoor fireplaces. Villa Hermosa is right next to the Santa Fe River on the east side, within walking distance of hundreds of galleries and famed Santa Fe restaurants such as Geronimo, El Farol, The Compound, and the Tea House. This custom single level home has air conditioning and radiant in-floor heat. Villa Hermosa can be rented with Casita Hermosa to create a 4 bedroom vacation rental. Contact Us for details. Two king beds and a queen, each bedroom has an en-suite bathroom, including a jacuzzi tub in Master bath. The casita is wonderful. We loved the property! The landscaping, the decor, the quality of the furnishings, a great kitchen and everything-it is all great. We have told all of our friends how much we enjoyed staying there. It was so clean that we thought we might be the first group to stay in the casita. Villa Hermosa is outstanding. A quiet place to relax and very convenient to all of Santa Fe. The home is large and well appointed with beautiful landscaping and a peaceful sitting area in the back and covered outside grill/seating area that makes dining outside enjoyable. The kitchen is stocked with all the appliances and utensils you would need. Overall, I would highly recommend this location for a family or group of friends. If you are looking for an extraordinary luxury house with a great location villa Hermes is it!!! And two casitas is your path to the front door. Lovely, clean property close to downtown plaza. It was quiet and house was very tastefully decorated with every amenity anyone could think of! Well equipped chefs kitchen. Would be great for 2-3 couples or a family. It was outstanding! Would definitely rent this property again! Our family decided to take a trip to Santa Fe. We stayed in Villa Hermosa for a few days and it was spectacular! The house is extremely elegant and well-built. It feels very spacious in the house. It has nice tall ceilings and each room has its own bathroom. The master suite is a sight to behold. It has a huge walk-in closet and a spectacular bathroom. The landscaping around the property is charming. We had a lot of fun playing on the lawn with our son. The location is unbeatable as well. We were one block away from Canyon Road, which has a bunch of nice cafes and galleries. We were also a short walking distance to the Plaza with all the great restaurants and shops. There's also a nice walking trail beside the house that takes you to a trailhead for the Dale Ball trails, which are very fun. In the future when we visit Santa Fe we will definitely stay at Villa Hermosa again! There was an envelope on the counter when we arrived introducing a cleaning team that would be taking care of us while we were there. No one ever came, but we really didn't need it. Maybe it was because we only stayed three nights. Hermosa is an adept description! What a luxurious home: no stone was left unturned in this elegantly furnished casa! The location is perfect, as it is right next to Canyon Road and downtown Santa Fe. Thank you to the Two Casitas Team for accommodating my family during our stay. Love the wine and goodies welcome gift!! All the right extra touches.